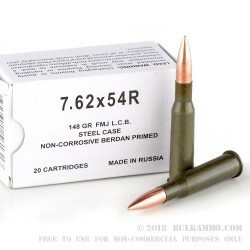 A solid replacement for the surplus shooter of 7.62x54R, this is a very close replication of the original steel cased round, with some notable improvements. 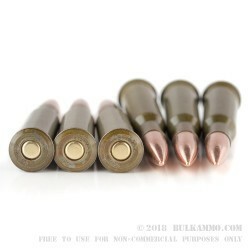 The bi-metal projectile is a Full Metal Jacket projectile that may not be allowed at some ranges due to the ability for the bullet to hold a magnet (it contains ferrous metal). Other than that, this is a very nice shooter grade ammunition that is suitable for everything from targets to hunting, though you may check your local and state regulations prior to hunting for the same reasons – the projectile may not be approved in your state for some game. 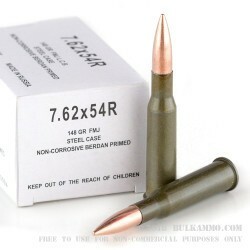 Known for its excellent terminal ballistics at even very long ranges, the 7.62x54R is very accurate, exceptionally reliable and offers a low per-shot cost. The steel casing offers this low cost profile, and it is not easily reloadable, nor is it perfect for some high tolerance guns. Luckily for the shooters of this steel cased round, most of the guns in this caliber are capable of moderate or better accuracy, and don’t have to be super tight in their tolerance ranges to achieve that accuracy. The Berdan primer ensures exceptional ignition reliability. The coated casing is reliable in feeding and extraction. The non-corrosive primer and powder is a great improvement over the surplus rounds this cartridge can replace.